On Tuesday July 29, 2014 Surgeon General Dr. Boris Lushniak made a call to action to prevent skin cancer. According the the American Cancer Society, the incidence of skin cancer is greater than that of breast, prostate, colon, and lung cancers combined. While there are many risk factors associated with skin cancer, the one that is most easily prevented is exposure to ulvtraviolet (UV) radiation from the sun and tanning beds. In many cultures, tanned skin is associated with beauty, while in others fair skin is associated with beauty. However, it is important to understand the tanning that occurs after sun or tanning bed exposure is the body's reaction to an external insult and it is actually a sign of skin damage. UV damage to the skin is not only strongly associated with skin cancer, but also with other signs of aging including fine lines, wrinkles, dark spots, broken capilarries, and sagging skin. Therefore it is important to protect ourselves from sun damage every day. The American Academy of Dermatology recommends applying a sunscreen with an SPF of at least 30 every day. Sunscreen should be broad spectrum, or have protection against both UVA and UVB. It should be applied even if it is overcast because some of the UV rays penetrate clouds and can damage the skin. Sunscreen should be applied even if it is cold outside. A common myth is that we do not need to apply sunscreen if we are not outside. Many people do not consider activities such as taking out the trash, getting the mail from the mailbox, and driving as being outside. However we receive sun exposure from all of these activities. Even when sitting indoors near a window we receive sun exposure. If outdoors for prolonged periods sunscreen should be re-applied every one to two hours and also after any water exposure such as when swimming. Some popular sunscreens include the Elta MD UV Clear, UV Physical, and UV Daily Tinted sunscreens. 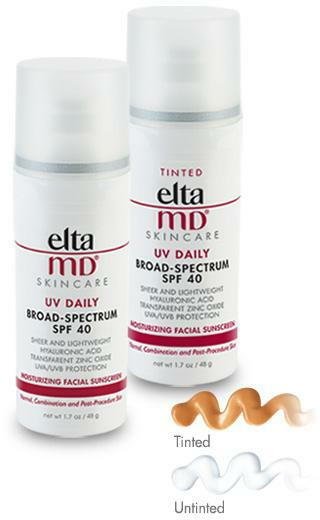 A popular sunscreen for the body is the Elta MD UV Aero. Other things we can do to protect ourselves is wearing protective clothing such as long sleeves and broad-brimmed hats, staying in the shade, avoiding the sun when the UV rays are strongest in the middle of the day, and avoiding indoor tanning beds. Several states have already placed restrictions on indoor tanning bed use by minors. By understanding the risks of UV exposure and protecting our skin we can decrease the risk for skin cancer and signs of aging in our skin and for generations to come. For a free consultation with Dr. Alex, our Medical Director, Contact Us.